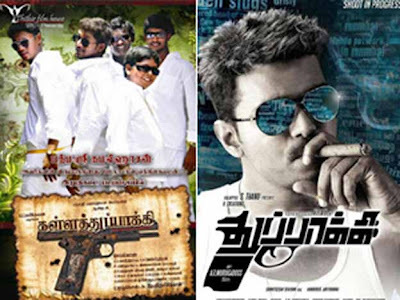 Vijay starrer Thuppaki, which is directed by AR Murugadoss, is in deep trouble with a court in Chennai banning the filmmakers from using the title. The petition was filed by debut director Ravi Devan, who had assisted Kamal Haasan in various films. In his petition, Ravi Devan had alleged that he had registered the title Kalla Thuppaki in 2009 and the shooting of this film is in progress now. According to Ravi, the title design of his Kalla Thuppaki and Vijay's Thuppaki are so similar that it could cause undue confusion. Though a complaint was filed at the Producers' Council, Ravi Devan alleged that no action was taken as Vijay's dad SA Chandrasekar heads it. Following this, he had knocked at the doors of the court seeking justice and had eventually got it with the court declaring that the filmmakers of Thuppaki is banned from using the title. Actress Pooja in Viswaroopam sequel? There have been reports that a sequel to Viswaroopam is on the cards and that Kamal Haasan has even canned quite a few scenes for it. When we quizzed the film's leading lady Pooja Kumar recently, on the truth behind these reports, she said, "I'm an actress and my work ends with shooting the scenes that the director wants. I really don't know if some of the scenes that I have shot for will end up in the 'sequel'." But Kamal is known to work with a bound script and so, when we pressed further on whether she has shot for scenes that weren't part of the script, she got quite evasive. "Well, I wouldn't want to spoil the mystery behind these reports," is all she revealed, adding that she has her fingers crossed on being a part of the sequel, "if Kamal sir decides to make one." Now, here's one girl who knows how to keep everyone guessing. Wotsay?